Looking for a simple and easy side dish to grill up? Look no further than potato packets. Slice, chop, wrap and grill. How easy is that? If you were ever a Boy Scout, then these probably look similar to the Hobo Packs, but these are a side dish and don’t have any protein in them. I kept these ones simple, but think about the variations you can come up with….anything you can possible think up would work here. Ok, ok….quit trying to be a smart alec and think up random elements like this was “Chopped” or something. Be reasonable. There are no hard rules about how to build these. Mrs. G and I were just making them for ourselves, so we kept them small. Tear off a sheet of Heavy Duty aluminum foil about a foot and half. 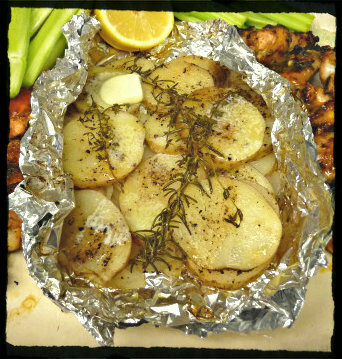 Roughly slice half an onion and place it in the center of the foil. Smash 3 or four good size cloves of garlic and toss on top of the onions. 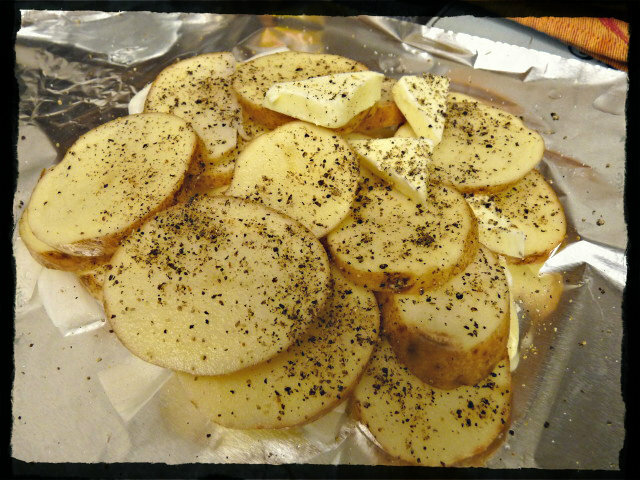 Next, slice one russet potato (or whatever potatoes you have on hand) about 1 to 1.5 cm thick. We left the skins on for simplicity. Add these on top of the onions and garlic. 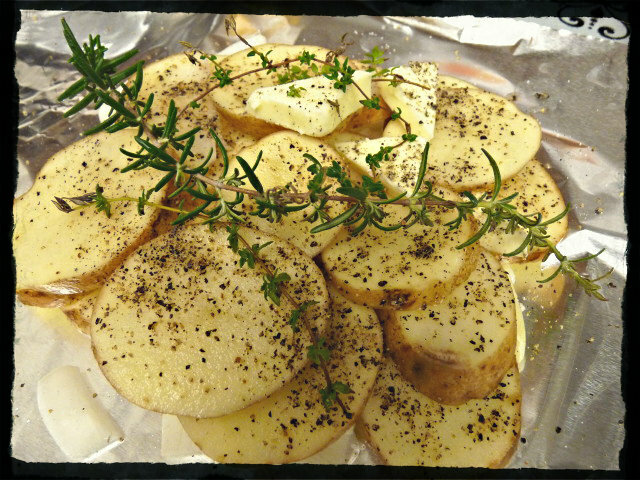 Add a few pats of butter, some salt and pepper, and some fresh rosemary and thyme from your garden. You do have rosemary and thyme in your garden, right? No? Well then just add whatever dried herbs and spice from your pantry that tickle your fancy. Maybe some Italian seasoning? Now toss the ingredients together until well mixed. 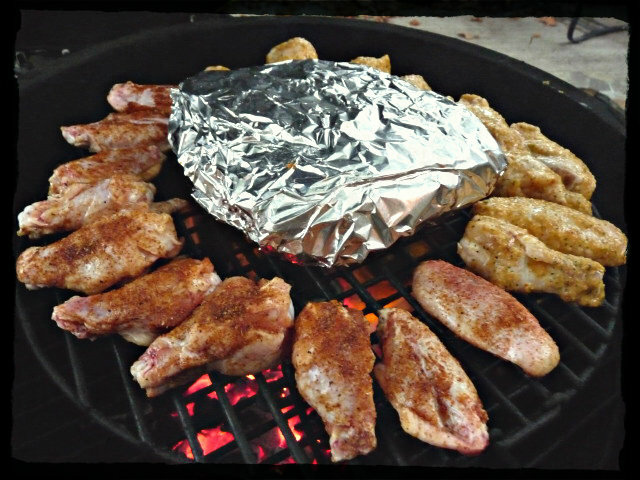 Bring the edges of the aluminum foil together and seal, making sure to leave some room in your pouch for steam. Tear off another foot and a half of foil andwrap this around your pouch making sure the seam of the first layer is opposite of the seam of the second layer. Now its time to take them to the grill. Once again, there are no hard and fast rules here. Obviously the lower the temp, the longer they will take to grill. I was doing these at 450F with a raised grate. They went on about 10 minutes before the wings and cooked for a total of 35 minutes, flipping every 10 minutes of so being careful not to pierce the packet. 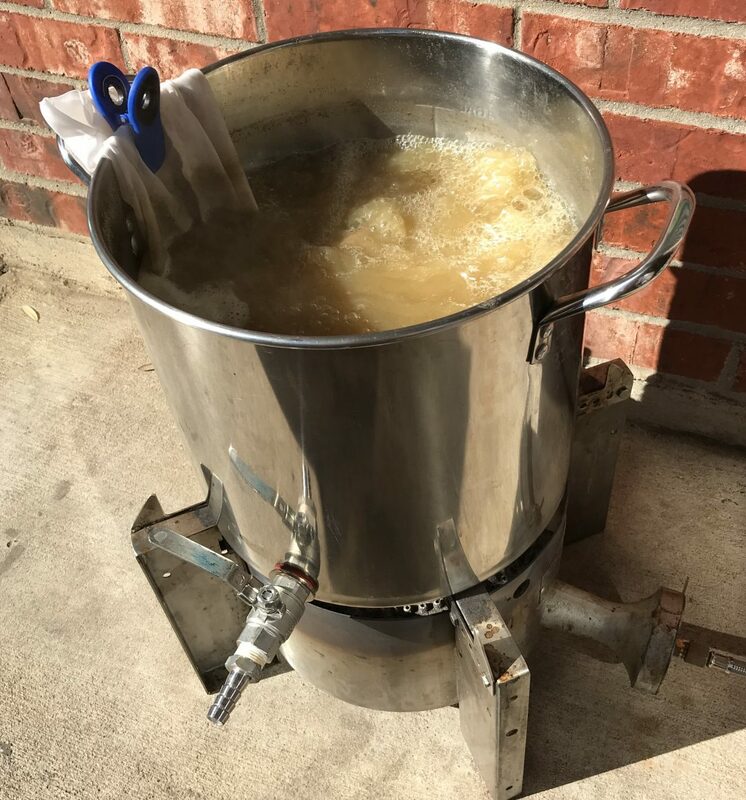 How hot and how long, you might have to experiment on your own depending on how you like your potatoes done. Whether you like them just cooked through or until they brown up and get crispy. Once they are done, be careful opening the packet. They will be full of steam and it would be easy to burn yourself. Like I said, we kept these pretty simple this go around, but your imagination is your only limit. I’m thinking next time doing one like a loaded baked potato or potato skins with some cheddar cheese, bacon bits and green onions or chives (possible some sliced jalapenos if you like some heat). Maybe a dollop of sour cream on top when they are done. Mmmm…my mouth is watering just thinking about it. Didn’t think of that, Adam, but you are right. 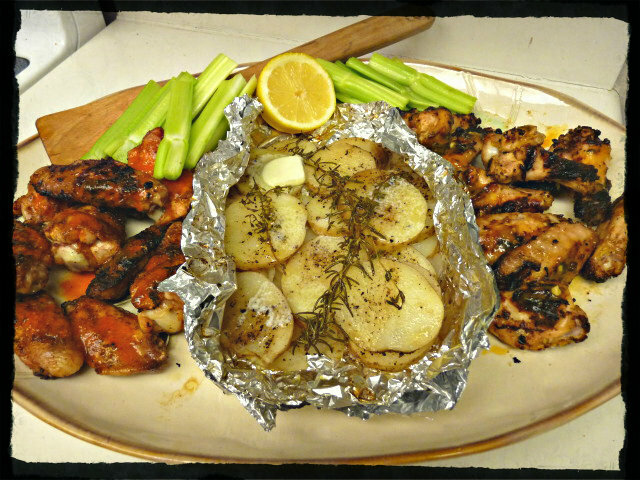 I wonder if I could do something like this using split fingerling potatoes. A little thicker and they may take some more time. I don’t see why you couldn’t. I don’t have much experience with fingerlings, but I think you are on the right track.